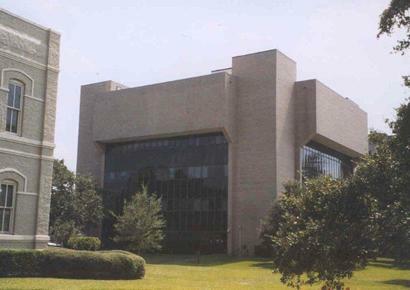 Brazoria County Courthouse Angleton Texas. 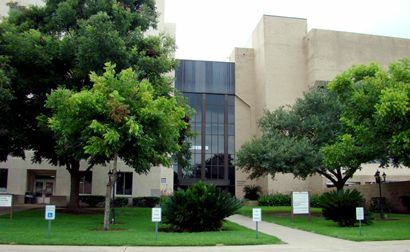 The 1976 Brazoria County courthouse is a modern, brick box with large glass panels on each side. 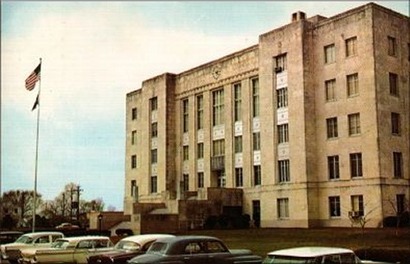 It is connected to the rear of the 1940 courthouse. The glass section connecting the two courthouses forms a pleasant atrium. 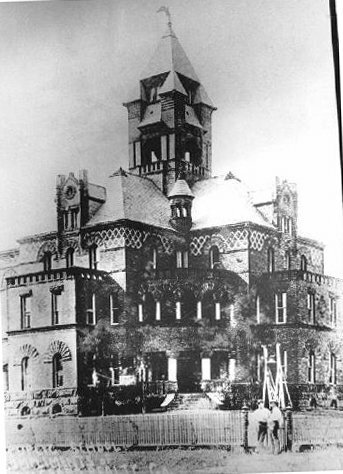 A corner of the 1897 courthouse can be seen on the left side of this picture. Architect - Lamar Q. Cato. The five-story courthouse finished in 1940 is a Moderne-style structure with interesting details, including Justice inscribed in the stone steps and metal panels depicting the area's industries: Fishing, cattle, chemicals, agriculture. 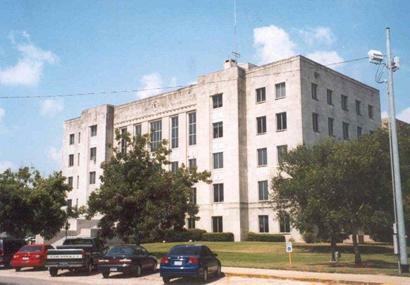 The 1940 Brazoria County courthouse was constructed after a 1932 storm damaged the 1897 courthouse. 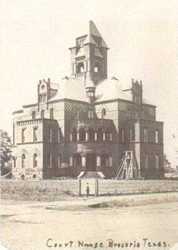 The county maintained offices in the 1897 courthouse until the 1970s. 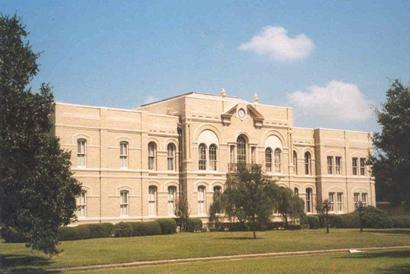 The 1897 courthouse has been restored and is in use as The Brazoria County Historical Museum. 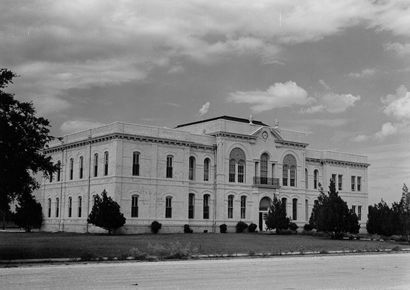 The J. Riely Gordon courthouse in Brazoria was demolished right after being built and only a few relics remain to proove that it once existed. 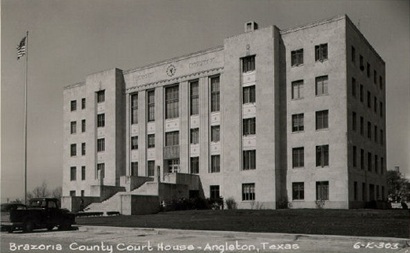 The former Brazoria County courthouse as it appeared in 1939. 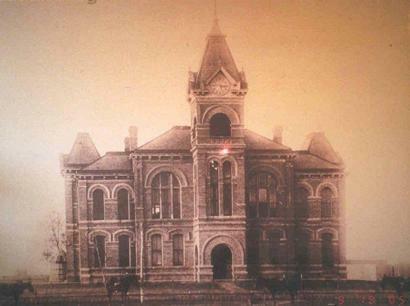 This picture is hanging at the entrance to the old courthouse, now serving as the Brazoria County Historical Museum. 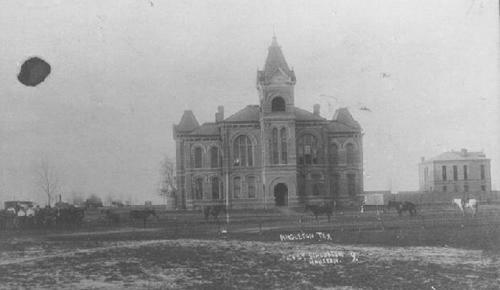 The 1897 Brazoria County courthouse was constructed from plans drawn by Eugene T. Heiner for the 1895 Matagorda County courthouse. The building was remodeled and enlarged in 1927 which included the removal of the ninety foot tower. 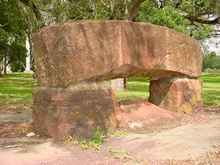 Brazoria County was organized in 1836 and a wooden building was the first courthouse. 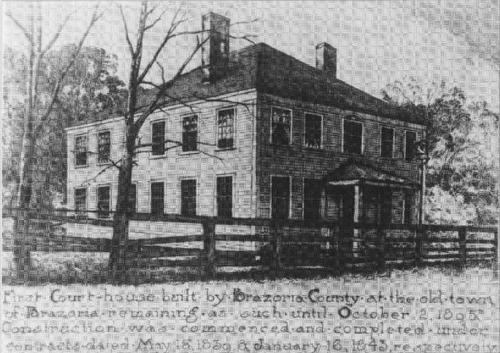 Sketch of the 1839 Brazoria County Courthouse in Brazoria, the first county seat.